Slug & Lettuce love to serve great quality food, fabulous cocktails and delicious wines, world lagers and beers in a comfy, safe, welcoming environment. From a relaxed daytime they transform into a lively night time venue perfect to meet friends, dance, hold parties, listen to great music – whatever you fancy really. 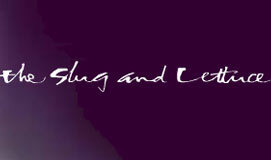 The Slug & Lettuce are offering 10% off drinks exclusively to Cheapside Privilege card holders. *Not to be used in conjunction with any other offer and please ensure you present your card on arrival or mention when booking over the phone. Address: Corner of Wood Str & Love Lane, London, EC2V 7JQ.